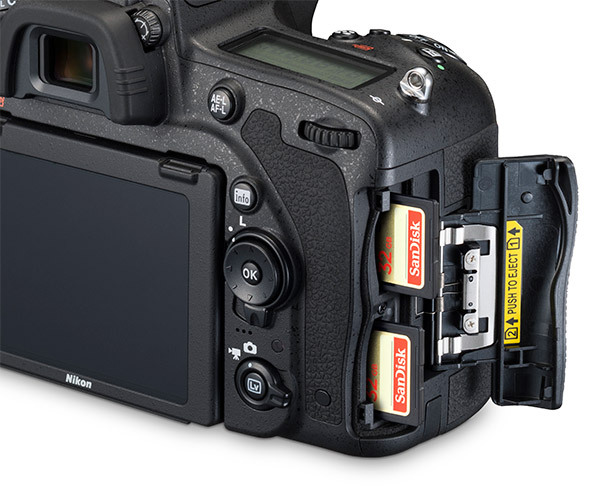 The Nikon D750 has two SD card slots that support fast UHS-I cards of type SDHC and SDXC. Cards with high write speed impove the performance of the D750. The UHS-I standard allows speeds up to a theoretical maximum 104 MB/s however actual write speeds in use may be lower. Because the Nikon D750 is capable of writing well above the Speed Class ratings, you would need to refer the SD card manufacturer’s claimed write speed. Many cards are only labeled or advertised with a read speed and the write speed may be significantly lower. Write speed has the greatest impact on shooting performance. 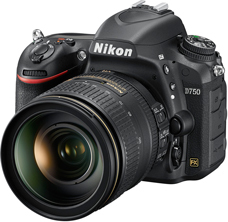 You can find a test of several different SD cards at fastest SD cards for Nikon D750. There is a difference even between UHS-I Class 10 rated cards. The D750 supports UHS-I but not UHS-II. There is no benefit to using a UHS-II card in the camera, in fact some can perform worse than a UHS-I card. But a UHS-II card can allow you to download images from the card faster. * Write speeds as stated by manufacturer. Actual write speed may be lower depending on device. what about Lexar Professional 600X 128GB / 95 MB ? Yes, the Lexar 600x 128GB card will work. Is there an issue with the 32GB cards? I have read in some forums where the D750 freezes up and some say it’s because of the SD cards. There is no issue with 32GB cards. Perhaps it was an issue with an individual card. What is the maximum capacity supported? The largest 256GB and 512GB both work in the camera. There aren’t larger cards available, but they may work also. Wow, just the info I needed before my big trip to New Mexico. Thanks! I was just wondering your thoughts on the difference between the Scandisk 64 GB 280 MBs and the Scandisk 64 GB 95 MBs for the D750. Is it a lot faster? The SanDisk Extreme Pro 95MB/s UHS-I is the better choice for the D750. The camera does not support UHS-II so the 280MB/s card is not going to be faster in the camera, in fact that card is slower in UHS-I mode than the 95MB/s card. I bought a d750 and tried to use an 8GB Sandisk Extreme Pro SDHC I U1 45MB/s. I could not even format it, getting an error message. I then tried a 16GB Sandisk Extr Pro SDHC I U1 Class 10 95MB/s, same results. Btw these cards work on my other dslrs. So I use it with a Transcend 16gb SDHC I U1 Class 10 and an old nikon memory card that both work fine. Been using them in both slots all summer with no issues. You sure don’t need to worry about swapping cards in the field. Getting ready to order two 256 GB cards. I’m getting an ERR message with the new Scandisk SKXC UHs-1 card that I just purchased. I have the 32 GB version of the same card and it works fine. What’s going on? How do I fix this? Please help. You can test the card in your computer, and also try formatting in your computer. If the issue persists there may be be an issue with the card. Sorry typo that is the ScanDisk SDXC UHS-1 card. 95 mb’s 633x. Just for the typo record, it is SANdisk, not SCANdisk. Dear Admin will SanDisk 256GB Extreme Pro UHS-I SDXC U3 Memory Card (Class 10) work properly on Nikon D750? Yes, the SanDisk Extreme Pro UHS-I 256GB SDXC card will work in the D750. Yes the Lexar 1000x UHS-II card will work in the D750. Note however that the write speed is lower and the camera only supports UHS-I. The read speed will be beneficial when transferring images to your computer using a UHS-II card reader. Which one of these you will prefer to use in D750? 3.SanDisk Extreme PRO 128GB UHS-I/U3 SDXC Flash Memory Card with up to 95MB/s- SDSDXPA-128G-G46? The SanDisk Extreme PRO UHS-I 95MB/s is faster than the Lexar and PNY in write speed. It will be faster in the camera. If you do a lot of continuous shooting it will clear the buffer a little faster than the other two cards. The Lexar 633X and PNY Elite Performance are basically the same; the PNY Elite Performance cards are made by Lexar. All the cards have similar read speed, when transferring photos from the card to your computer. Lexar Lexar SDHC 32GB Professional (2000x / Speed ​​Class 3 / Class 10 / Maximum Transfer Rate 300 MB / s) . it is much faster than the SanDisk extreame PRO UHS-I 95mb? It won’t be any faster. The D750 does not have the UHS-II interface, so it will be the same speed as a fast UHS-I card in the camera. It would be faster only in a UHS-II card reader (to transfer images to your computer). if asked single option for the card to b used in D750 what would it be? The D750 uses UHS-I cards. You can use UHS-2 cards also, but they will only work in UHS-I mode. The other term you may see on a card is the UHS Speed Class. These are speed ratings and not types of cards. You may see U1 or U3 on the card. Either will work in the camera. These are all basically the same. The older Extreme Pro 95MB/s were U1 before the U3 rating was created. The newer cards have U3 on the label, but they perform the same. Question: Do 256G Sandisk Extreme Pro 95’s run slower than their small capacity cards in the same series? … I ask this because I tested my Sandisk Extreme Pro 95, 32G card and it’s faster – 92mb\sec read and 89mb\sec write. Is it normal for larger cards to run around 8% slower than larger cards? Will the Lexar 64GB 95MB/s 633X and / or 32GB 150MB/s 1000X work on D750? I have these cards and wonder if taking the photos with these will be affected in terms of speed or freezing? Hi Sailaja, both cards will work in the D750. In actual use in the D750 the Lexar 1000X card write speed will only be slightly faster than the 633X card. The D750 doesn’t support UHS-II so the main benefit of that card would be download speed when transferring images to your computer. Hi, how about ScanDisk Ultra SDHC and how many RAW photos (approximate) 16GB can store? I have a new d750 (fireware 1.10) and a new Transcend 64GB SDXC Class 10 UHS-1 90MB/s. It works for a while and then I get a card error. Then I can’t even format the card on the camera, but on my computer it still works well. To get it working I have to copy my photos to computer and after plugging the card back to the camera there is no the error anymore. So, I format the card on the camera again to be sure that everything plays well, but after hundred shots I’m getting the same error. It looks like camera doesn’t work well with the card. So, which card would you suggest to use? It could be that you have a defective card. There should be no compatibility issue with that combination. The SanDisk Extreme and Extreme Pro are good choices. its most likely a fake card did you buy it from ebay ? I’ve been bought a Lexar 128gb SDXCII 1000x card. Just discovered it’s incompatible with my Nikon p500 and p520 but was wondering if it would work in my D750? (I don’t have the camera with me atm so can’t test it). Also, can you explain the difference between SDHC, SDXCI and SDXCII in terms of why they work in some cameras but not others? The Lexar 1000x UHS-II 128GB card should function in all your cameras. 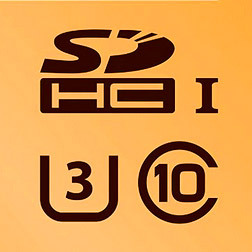 UHS-II cards are backwards compatible to work in UHS-I and standard SD devices. The difference between SDHC and SDXC is the file format. The SDHC supports up to 32GB and uses FAT32, while SDXC allows for larger capacity by using ExFAT format. You can format the SDXC with a FAT32 file system and it should work in cameras that don’t support SDXC (ExFAT) but will be limited to 32GB capacity. According to the manufacturer, the Nikon D750, P500 and P520 support SDXC so there should be no issue using the UHS-II SDXC card in your cameras. That’s interesting as I’ve tried reformatting it and yet the two coolpix cameras say ‘this card cannot be used’. I’ve tried checking the lock/unlock (the most obvious and yet easily missed problem lol) and have reformatted on all the different file allocation sizes on ExFat… all to no avail. I should point out that the Nikon site doesn’t list the SDXCII as being compatible with the coolpix cameras, though it may simply be because the pages haven’t been updated since the cards were released. Any other suggestions? I can’t think I’ve missed anything :/ My other cards – Sandisk SDHC extreme pro – all work fine, so I know it’s not an issue with the cameras. Would it be a software update requirement do you think? Also… just managed to test it in a D750 and it works fine – so it is definitely incompatible with the two coolpix cams. I’m very curious why that would be if it is, as you say, backwards compatible. Interestingly, although it says the card can’t be used in the coolpix’s, it DOES create a Nikon folder on the card, with a DCIM folder and subfolder, and the other folder that is ever present (can’t remember what it’s called as I never have cause to use it). I definitely don’t understand what the issue is! Nikon shows P520 compatible with SDXC and 128GB cards, so it should work. As stated, UHS-II cards are fully reverse compatible (in fact they have a separate set of contacts for this) so it will behave as a UHS-I or standard SD card in devices that don’t support UHS-II. The P500 only shows up to 64GB approved, so it could be firmware limited to not accept cards larger. Have you tried formatting the card as FAT32? This will be limited to 32GB capacity. I have used Transcend 90MBs/60MBs for months and never had a single problem. I wanted an extra set so I bought Sandisk Extreme Pro UHS-I 95/90MBs. The difference is amazing so they have turned my Transcend cards into spares. Again I have been confronted with my mistake to buy cheap(er) accessories for my $ 2000 camera. It’s just too foolish. The highest 42Mbps bitrate would mean you could record about 3.17 minutes per GB, so a 16GB card would yield about 50 minutes. For 24Mbps you could get about 5.6 minutes per GB and the 16GB card would yield about 89 minutes. At 12Mbps you could get at about 11.1 minutes per GB so a 16GB card could record about 178 minutes. In actual use you may find longer recording times depending on the compressability of your subject. Note that you do not need the fastest speed card to record video with the D750. Any Class 10 / UHS Class 1 (U1) card should be able to record the highest bitrate without issue. I have a d750 too, and use a transcend 64 GB class 10 / uhs 1 too. I get the same card error After a few shots. The card however is fine and still readable eith a different camera or my PC. After miunting the card in one of These other Devices the card functions again for a couple shots in the D750 but gives the error again After a short time. The same happend also with an older 8 GB card. ….and I have turned off all ‘peripherals’ (High ISO noise reduction, Active D Lighting, etc.). Tried reversing the cards in slots, tried using only one card at a time (in each slot), still happens occasionally. Cards formatted in camera and also tried SD Formatter formatting in my pc, no joy. Hello A. Keith. You could try using a different card to see if that fixes the issue. It is possible that one or both cards are defective (if from the same batch). If the issue persists with a different card then the camera should be sent in to Nikon for service. Speedy response. They are from the same batch, I will try your suggestion. I hope it is simply a card issue! (Lexar Professional 2000x SDXC Memory Card – 64GB w/ Card Reader) is working for Nikon 750D or not? which Memory Card You recon for best photo transfered? Yes, the Lexar 2000x UHS-II card will work with the D750. It operates in UHS-I mode in the camera. You can use the included UHS-II card reader to download images in UHS-II mode at very high speed. I am using sony 95MB/S SDHC card for nikon D750. When i use the same card in to other video camera Some database issue showing then i press ok after that the card is working. If i put back the card in the D750 there will be any issues???? It is always recommended to format the card in the camera before you use it. Moving cards between devices could possibly cause issues, but in reality it is not usually a problem. The Sony wants to put its files in its own directory structure and configuration file, which is probably what that message was about. I just bought a new Nikon D750. And, I also am having problems with one of my SD cards, after using it only ONCE. What gives??? I’m a professional and can’t afford to have a card die on me in the middle of a gig. Does the D750 have a mechanical problem that I need to worry about or get fixed? The card is the SanDisk 32GB/95mb UHS-1. Hello. It could be a defective card. Sandisk cards have a lifetime warranty. I would suggest exchanging the card and see if the problem persists. Do I need both cards in the slots to get the optimum performance of the D750? You only need to use one card. This will give the fastest performance. Hi! I am baffled about what version of SanDisk Extreme Pro is the best choice for D750 cos of the sdxc format needing a higher support capacity. Would D750 be compatible with Extreme Pro 95mb/s U3/ class 10 /UHS-1/ V30 with either 32, 64, 128 gb…..etc.! And are those two card slots required unifying cards inserted for the best performance? Thanks. The card you mention is compatible and any capacity will work. It is best to use the same card or a card of similar speed in both slots if you plan to use backup mode or overflow mode. If one card is slower it will degrade performance. I shoot street style and backstage photography and need an SD card with a really fast write speed – what would you recommend? I’ve been using the 64gb 1000x UHS-II card but still have to wait sometimes whilst it writes to the camera. You mentioned the UHS-II will only work in UHS-I mode so its pointless with d750 apart from the fast reading aspect. I really need advice on the best UHS-I alternative. The SanDisk Extreme Pro UHS-I is about as fast as the camera can go as far as write speed. Its write speed is faster than the Lexar 1000x UHS-II card. I just bought nikon d750 and was wondering which company card will be better…lexar, sandisk or toshiba…from the list of best memory cards for the nikon d750 mentioned in this page?? Any of them will work. As fast as you would need is the SanDisk Extreme Pro UHS-I card. I have just bought a D750 and also the 32gb Sandisk Extreme with 95mb/s read and 90mb/s write. I want to use this card in Slot 1. For slot 2, I have an older card for Sandisk 32gb Pro with 40mb/s. I intend to used Slot 2 as a backup. Picture will be taken in RAW. The camera will work with that setup. Be aware if you use a slower card in Slot 2 and back up to it, the camera write performance will be limited by the slower card. If you stay under the buffer limit there is little harm, but if you use up the buffer it will take longer to clear and your fps with the buffer full will drop. I apologize in advance if this question has been asked in the past. I was reading that the firmware for the D750 would be updated in the near future to accept UHS-II cards can you confirm as if this is the case i would much rather spend my money now on that speed card as opposed to purchasing two UHS-I cards now and in the future upgrading. It is not possible to accept UHS-II with a firmware update. The UHS-II bus requires a different physical connection that the D750 does not have. You can use the cards in the camera but they will be limited to UHS-I speed. The 170MB/s read speed for that card can only be reached using a special SanDisk card reader. Outside of this reader the card will be limited to standard UHS-I speeds. So in the camera it will perform the same as the 95MB/s card.